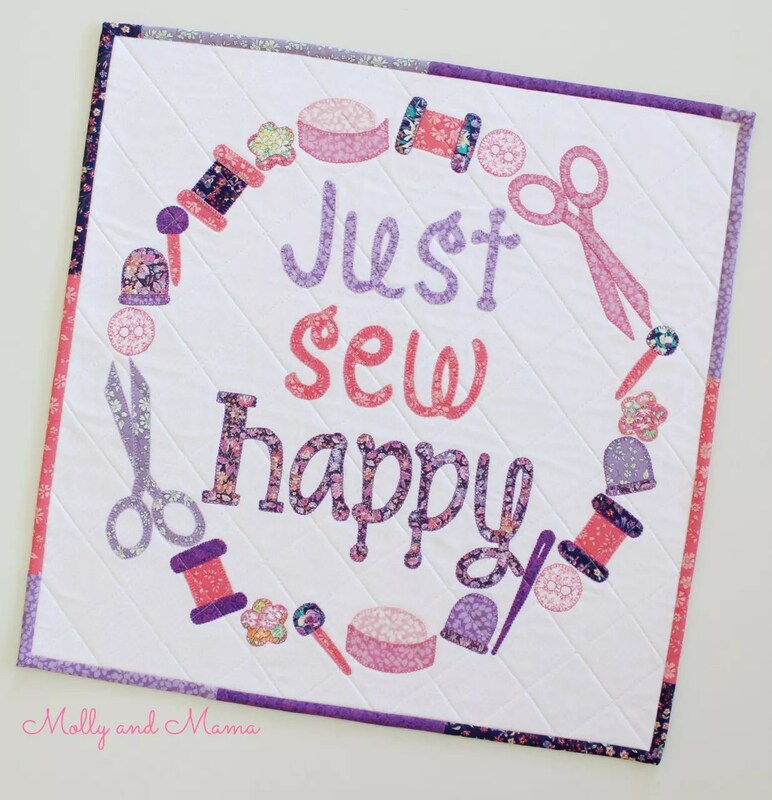 Jemima from Tied with a Ribbon recently asked me to sew one of her new patterns, the Just Sew Happy mini quilt. Being the appliqué lover that I am, I couldn’t say no! And I just love how it turned out. Choosing fabrics that would work nicely with each other was the most difficult part of putting this pattern together. If you know me well, then you know I’m really not a huge fan of purple. 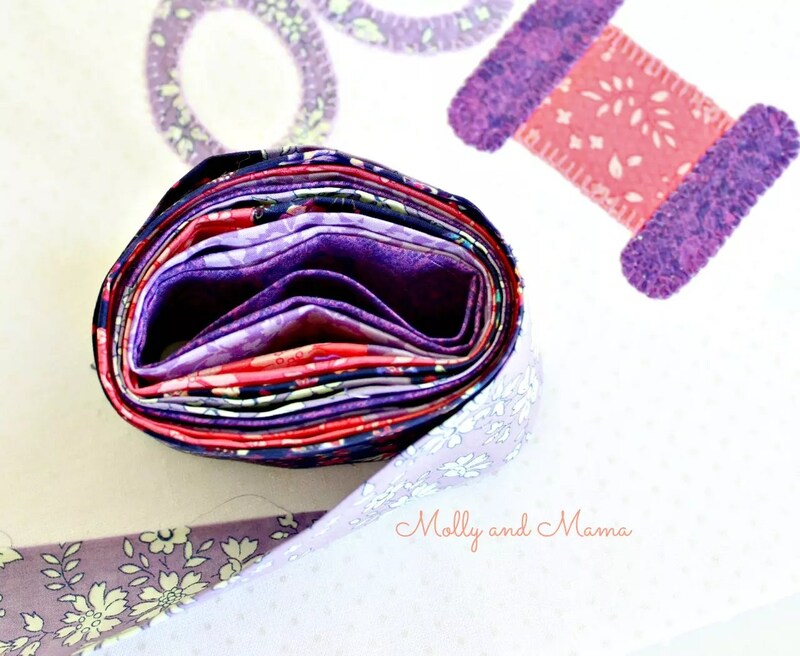 However, I had some lovely lilac pieces of Liberty in my stash and after pulling a pretty bundle together I could really see how well they suited the pattern. Some shades of pale pink and coral offset the bold lavender hues and gave the fabrics a softer feel. My first step was to choose fabrics for each of the appliqué sewing tools and notions, then the words. After cutting out and arranging all the pieces onto my backing fabric, I was ready to secure the appliqué and start stitching. 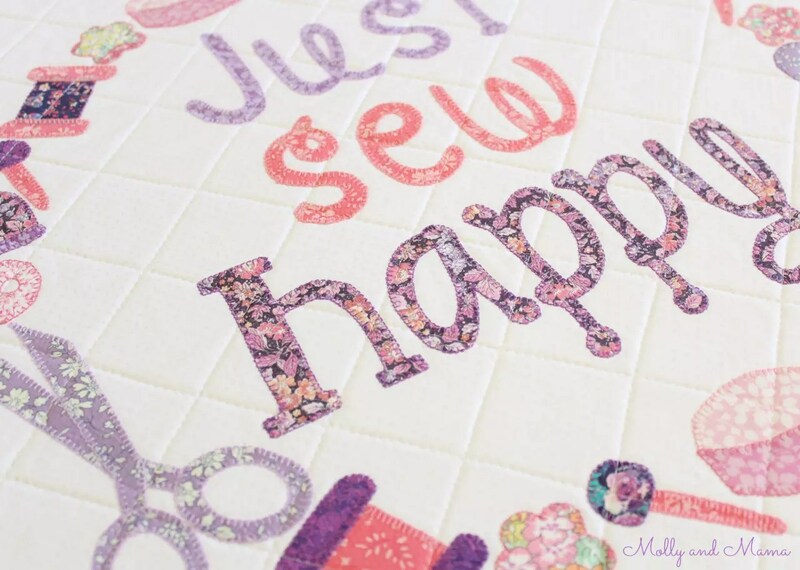 I used my sewing machine to blanket stitch around the outside edge of all the words and shapes. There was lots of ‘presser foot raising’ and ‘pivoting’, as well as ‘top thread changing’. But it was still quicker than if I had done it by hand. And I really love the neat and uniform finish! I chose to quilt the mini with a simple diamond or cross-hatch effect. I didn’t want to detract from all the pretty appliqué pieces, but I felt it needed something. I realised I didn’t have enough Liberty yardage to create binding from a single fabric. But I’m actually really glad, because I’m super happy with the way this patchworked strip binding turned out. Here is it in a pretty roll before I attached it to the quilt. I love this mini quilt because in fact, it’s not actually that mini. Generously sized at 21″ square, this quilt would be the perfect addition to any sewing room wall. It even looks great here in the garden. Thank you to Jemima for the opportunity to sew this beauty! 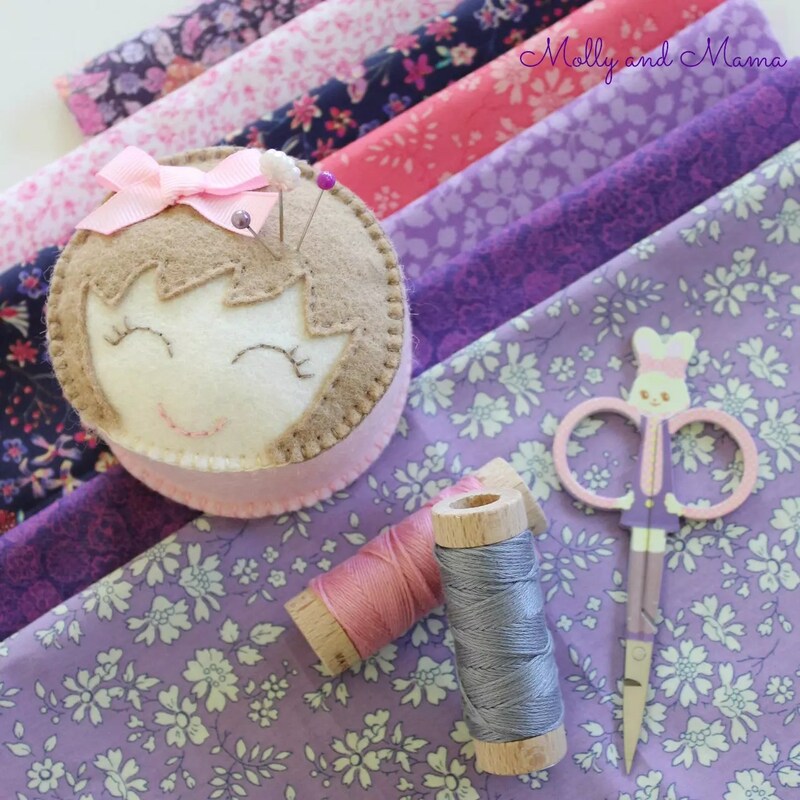 The pattern was clear and easy to follow, and the results are gorgeous! 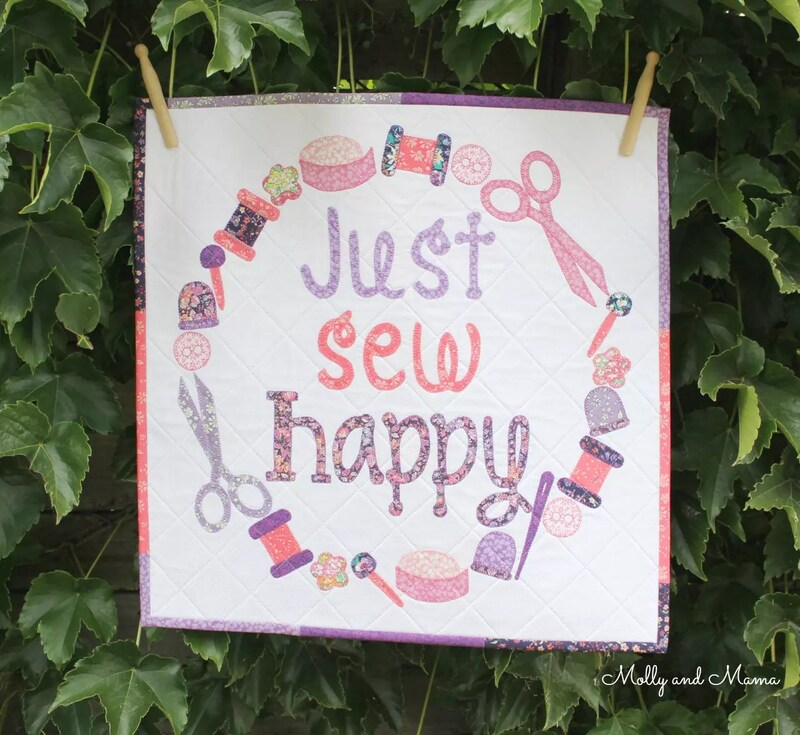 For more examples of the quilt, head to instagram and the hashtag #justsewhappyminiquilt. You can also see my other sewing projects there. I’m updating things almost daily! 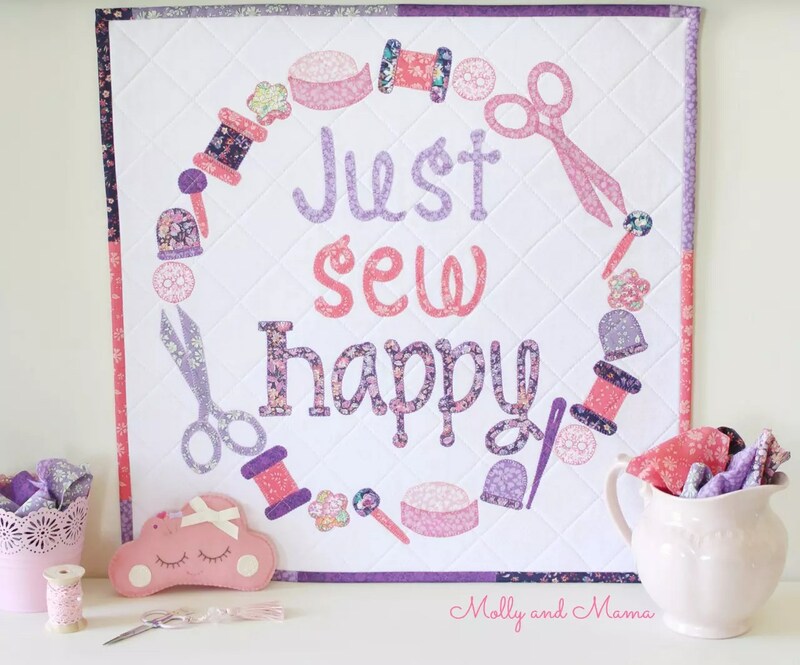 This looks amazing Lauren – thanks for sewing such a beautiful Mini Quilt. Thank you Ayda, you’re so kind.